Everglades Elementary School (EES) students wrote a book entitled “If You Give a School an Ag Teacher” for the Just Read, Florida! Florida Department of Education literacy contest and won third place. The book chronicles how EES started their elementary agriculture program. The story of how the young people developed the program is depicted through student illustrations. Each agriculture class submitted a page for the book and the school teachers selected the best of the best for the final publication. The students’ hard work paid off with a visit to Tallahassee. 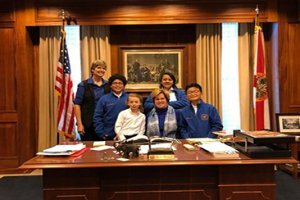 The students and their principal, Leslie Lundy, flew to Tallahassee on Jan. 25 to receive their award and meet with legislators. Students met with Florida’s First Lady, Ann Scott, Commissioner of Agriculture, Adam Putnam and State Sen. Denise Grimsley. The school was awarded $250 dollars for their efforts. A 2016 mini-grant from the Florida Farm Bureau Federation helped the program become more successful. A donation from Everglades Equipment in Okeechobee will fund animal feed expenses for the next year. The students’ book will be available at Everglades Elementary School.